StrongVPN isn't a great VPN, but it covers the basics, and the ability to connect up to 12 devices simultaneously might appeal to some. While many VPNs try to win you over with gimmicks and feature overload (‘8000 locations!’, ‘$3 a month if you subscribe for 7 years!’), StrongVPN offers a simpler service which focuses on the fundamentals. There are apps for Windows, Mac, iOS and Android, for instance, and setup instructions for routers, Fire TV, Kodi and more. 650+ servers in 46 cities across 26 countries. You can connect via L2TP, SSTP, OpenVPN, IPSec, and IKEv2 protocols, there's 24/7 customer support and a 30-day money-back guarantee. Nothing amazing, but not bad specs, either, and adequate for many people. The service does have a few surprises, too, including the company's own secure DNS system, limited phone support (9am - 5pm Monday to Friday, CT) and the unusual ability to connect up to 12 devices simultaneously. We'd hazard a guess that's more than you need, but it's there if you need it. Pricing is a reasonable $10 a month billed monthly, but only drops to $5.83 on the annual plan (CyberGhost, KeepSolid VPN Unlimited, NordVPN and others all have plans for under $3 a month, though you'll sometimes have to sign up for two or three years to get them.) Still, overall, there's more than enough here to justify a closer look. We are a zero-logging VPN service, meaning we’ll never track or store your data while connected to our VPN service. The only personal information we collect from you is used for your account setup, such as an email address and payment information. Unfortunately, there's none of the extra detail you'll often see elsewhere. Does the company log connections to its service? Which details are included, and how long are they kept? Does the service prioritize or penalize any protocol above another? We've no idea. Overall, StrongVPN's core terms of service deliver essentially what you'd expect, with no logging of how you make use of the VPN. But the lack of detail makes us wonder whether there might be any lesser issues here. It's also worth noting that the service is based in the US, so doesn't have quite as much legal and privacy protection as you'll sometimes get elsewhere. StrongVPN really needs to do more to make its procedures clear, though, especially as big-name competitors (NordVPN, TunnelBear, VyprVPN, more) are now going as far as having their systems publicly audited to prove their privacy credentials. Just saying 'we don't do bad stuff, honest' is no longer enough. With no trial available, you must pay for at least a month of StrongVPN service before you can try the service (although there is a 30-day money-back guarantee.) We parted with our cash, and were presented with buttons to download the Windows, Mac, iOS and Android clients. The website also has detailed manual setup instructions covering routers, Kodi, Linux, Chrome OS, Amazon Kindle and more. Our Windows client correctly chose our nearest server and displayed it on a world map. That's handy as a visual reminder of the current location, but the map doesn't have any other practical function, so for example you can't zoom and pan around it to select other servers. Tapping the current location name takes you to a more conventional list of your other options. For some reason, the client consistently displayed these in reverse alphabetical order (United States at the top, Australia at the bottom.) We could change the sort order at the top of the window, but the client switched it back when we next reopened the list. There's none of the functionality you'd hope to see in a VPN location picker. No server load figures or ping time to identify the best choices, no favorites system, no 'recent connections' menu. Right-clicking the client's system tray icon displays a Connect option, but you can't choose a new server. Switching servers is more awkward than usual, as you can't choose a new location until you've closed the current connection. There are none of the more advanced features you might expect elsewhere, though, such as DNS leak or configuration options, or the ability to auto-connect when accessing insecure wireless hotspots. Testing the kill switch revealed an unexpected problem. When we forcibly closed our connection, the client correctly blocked internet access, updated its interface to show there was a problem and tried to reconnect. But it then hung at the reconnection stage. We had to close and restart the client before we could continue. This isn't a fatal problem - our privacy was always protected - but it could be inconvenient. Potential reconnect bugs aside, StrongVPN more than covered the basics, though, and performed its core functions well. IKEv2 connections were speedy, its OpenVPN setup used very secure AES-256-CBC encryption, and there were no DNS or WebRTC leaks. StrongVPN doesn't claim to unblock specific websites, but the company makes it clear that's a big advantage of the service, stating that it allows you to "free yourself from the local limitations of your IP address and enjoy a truly World Wide Web." Accessing BBC iPlayer still wasn't quite as straightforward as StrongVPN suggested, but we managed it on one of the three UK servers we tried, and that's enough. Viewing US-only YouTube content is so easy that almost every VPN in the world can do it, but we tried it anyway, and sure enough, StrongVPN passed the test. Netflix is the real measure of a VPN's unblocking ability, of course, but StrongVPN managed that, too, allowing us to stream US-only content from all five of our test servers. Our performance tests got off to a positive start, with our closest UK servers reaching a decent 60-65Mbps on our 75Mbps test connection. US speeds were almost as impressive, averaging 55-60Mbps from the New York servers. Most long-distance speeds had increased significantly since our last review. South Korea was an excellent 50-60Mbps, Australia managed a very usable 25-35Mbps, and Singapore's average 30Mbps was also faster than most. The only problem location across all our tests was Poland, which peaked at around 10Mbps but was often much, much slower. That could have been a temporary issue, though, and overall StrongVPN was, well, a very strong performer. If you're not so lucky, StrongVPN's support site has some tutorials and troubleshooting guides. They're not as well organized as we would hope, and some are seriously out of date (the 'Resolving speed issues' Windows article hadn't been updated for 10 months, and covered the previous Windows client.) But there's some useful information here, and live chat is available if you need more. 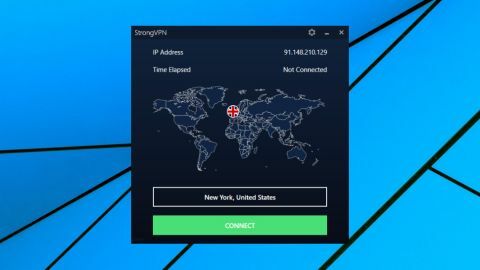 StrongVPN doesn't have many features, but it handles the VPN basics well enough, and if being able to connect up to 12 devices simultaneously appeals, it might be worth checking out.